We are the GIBSMIR-Family and would like to invite you to swap your art (not bigger than 12×12 inch) with a Swiss artist at the Collective Art Show, L.A. You can see all the works online at www.gibs-mir.at/la.html. The idea behind the project, Tree Structure, is to present on a table at Collective Show, L.A. small-scale work by Swiss artists. Artists converging in Los Angeles are invited to swap their work with work set out by others. To continue the game, participants can exchange repeatedly, replacing new works on the table. Every substitution will be registered with the respective artist’s name/work/website, which can be tracked in real-time on the website www.gibs-mit.at. Visit us at Collective Show Los Angeles 2011 on Saturday, January 29, 12-6pm to swap your work with work on our table. Published on 27 Jan ’11 12:32 pm. “In conjunction with the launch of Dispatches and Directions, ART2102 is inviting some of the most interesting artists and organizers in Los Angeles to engage each other in discussion on a variety of topics relevant to their work. Published on 22 Jan ’11 4:37 am. 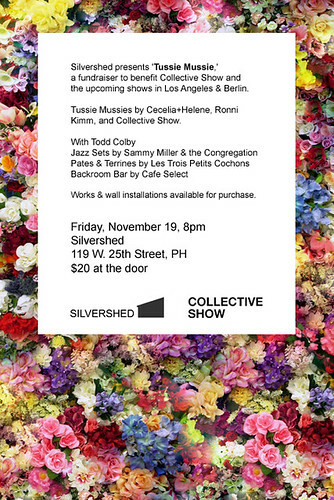 Collective Show Los Angeles Opens Tonight – Thursday, 1/20! If you’re around tonight, stop by the opening reception for Collective Show Los Angeles 2011! Published on 20 Jan ’11 5:33 pm. Los Angeles, CA – January 11, 2011 – Collective Show is pleased to present “Collective Show Los Angeles 2011,” an artist-organized exhibition of contemporary art groups recently established in Los Angeles. This collaboratively curated “group show of group shows” features artist-run spaces and projects formed in the past five years. Published on 20 Jan ’11 5:07 pm. In conjunction with Collective Show Los Angeles, Darin Klein and Suzanne Wright will host the 2nd Annual Queer Pile Up! at Amy Adler’s Echo Park studio. All are invited to attend the one-night-only showcase of local queer artists and performers! If you are looking to participate, arrive with everything you need to perform or install your presentation. Artists perform and are shown on a first-come, first-served basis! Published on 16 Jan ’11 10:46 am. “Over the past several years ART2102 has acted as a platform for artists and curators in Los Angeles to realize their projects and exhibitions. From its space in Boyle Heights, ART2102 hosted a vibrant program known for its open cultural discourse and flexibility of ideas, and for engaging both local and international artists at various stages in their careers. Gradually, ART2102 moved away from this physical site as its programming and initiatives engaged with the large network of other artists-run spaces across Los Angeles and Southern California. Published on 11 Jan ’11 5:32 pm.